If you’re a football fan, I’m sure you enjoyed Super Bowl 52 where the GQOAT (Greatest Quarterback Of All Time)–Tom Brady– passed for 500 yards but still lost to a back-up quarterback named Nick Foles. Foles and the Philadelphia Eagles 41. Brady and the New England Patriots 33. Great Game. David vs. Goliath in a photo finish when Brady’s last second Hail Mary pass into the end zone fell harmlessly to the turf, and the Eagles from the City of Brotherly Love won their first-ever NFL Super Bowl Championship. Are you living with that same motivation? When Nick Foles realized that the Philadelphia Eagles had won Super Bowl 52, he raised his eyes upward, pointed his finger toward the heavens and gave all the glory to God. Gave glory to God. What does that mean? To give “glory” to someone else is to give them credit and honor for something they’ve done. It is to deflect praise from yourself to another who is more worthy of that adulation. A humble person knows that their natural gifts and abilities come from God (“You can’t put in what God has left out”). They understand that it’s only through their Creator that they “live, move and have their being” (Acts 17:28). Humble people comprehend that “from Him, and through Him, and to Him are all things. To God be the glory forever and ever” (Romans 11:36). They are grateful that God has saved them, changed them, and is producing character qualities in their life–allowing them to succeed–which are primarily of His making, not their own. Humility is the opposite of pride, which selfishly pretends that I am the center of the universe, self-made, and should be congratulated for my achievements. That attitude cost Lucifer his place in heaven and curses every human being who follows his example. It’s humble faith that gives God his rightful place in our lives. Rick Warren is right. It’s not about you. Everything you have and are comes from others, especially your Maker and Savior God. The paint can’t take credit for the painting–that goes to the artist. The rocket fuel and boosters don’t applaud themselves for a successful SpaceX launch. That honor goes to the visionaries, producers and technicians who created and operated it all. “If I am lifted up, I will draw all people to myself” (John 12:32). 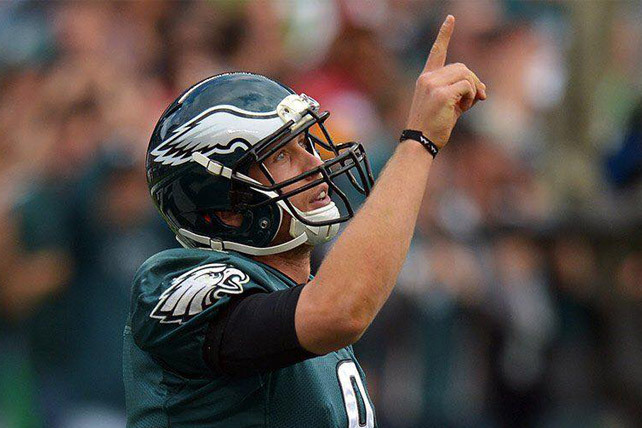 I’m praying that multitudes of people will launch their salvation journey through watching Nick Foles point the way. The Washington Post told part of Foles’ personal story this past week. Nick Foles is one of many Philadelphia Eagles who understand where their true power comes from. Did you notice that when the Super Bowl trophy was presented to Coach Doug Peterson, tight end Zach Ertz (who caught the winning TD pass), and Nick Foles, the first thing ALL THREE did was give glory to God? How can we bring glory to God and follow their example? Jesus clearly commands that the goal of our lives should be to behave so that God gets the glory. Live so that people will see your life and give your Father in heaven glory, not you. It is a peculiar kind of living. In order for God to get glory from the way we live, we must be engaged in good deeds. It is not so much by avoiding gross sins that God’s people display his glory, but rather in the pursuit of good deeds, acts of generosity, works of kindness, ways of love. It is possible to be a kind of do-gooder that brings no glory to God. There are philanthropists and benefactors who spend time and money to alleviate suffering, but who may not even believe in God let alone do it all for his glory. So when Jesus says, ‘Let your light shine that men may see your good deeds and glorify God,’ the light must include more than the mere action of the good deed–but your attitude and your motivation also. We have to do good as one does it who is depending on God’s strength. Not mere good deeds, but good deeds done in a spirit that comes from a joyful dependence on God’s help. We owe every fiber of intelligence to God, and the slightest resolve to do good is a gift from him. Apart from him we are all cripples. And worse than cripples. We would fly into nothingness without his sustenance, and we would degenerate into devils without his grace. I remember the first time, and many times since. when I intentionally committed myself to live for the glory of God, the One who truly deserves all the praise and the honor. Is that your motivation for living?